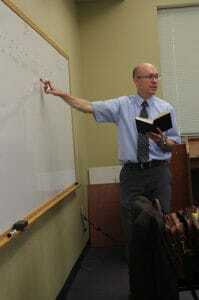 The Christendom Classical Languages Institute offers six-week introductory courses in Latin and ancient Greek. Each course covers the equivalent of a year-long introductory sequence at the college level. Upon completion, students will be able to read classical, biblical, and patristic literature with the help of a dictionary. The Institute is open to undergraduate and graduate students, as well as hard-working and highly motivated high school students. No previous study of either language is required. The first three weeks of the Greek sequence will be taught by Prof. Christophe Rico and Mr. Stephen Hill of the Polis Institute. For this sequence two levels are planned: one for absolute beginners and one for those with prior experience reading ancient Greek. These three weeks will include 90 hours of full immersion classes and activities. Details for the Polis program can be found here: http://www.polisjerusalem.org/virginia. 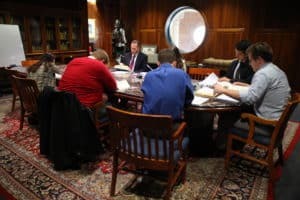 Christendom College faculty will teach the second three weeks of the Greek sequence and the entire six weeks of Latin. The second half of Greek will complete the course of elementary instruction for those who take the beginners’ level of the Polis program. The Latin course will consist of a systematic presentation of grammar, syntax, and vocabulary, as well as extensive continuous readings and Latin conversation. The Institute takes its character and animating spirit from a firm conviction that the loving study of Latin and ancient Greek, as living languages, is a perpetual source of cultural renewal. June 24 – July 12. Register through the Polis Institute. Apply online, submit a mail-in application to begin the registration process. Then see our current course offerings page or call (703) 658-4304 to register. See our Summer page for information on residential life, dietary restrictions, and to register to for transportation to and from our Front Royal, VA, campus. For questions about the Polis program, please contact Mr. Stephen Hill, rstephenhill@gmail.com.